Minister of Transport, the Hon. Marc Garneau, has appointed two new Directors to the Board of the Windsor Port Authority. The appointments of Karen Behune Plunkett and Thomas W. O’Brien are effective June 29, 2018. Karen Behune Plunkett brings expertise to the Board in strategic planning, business development, marketing and public relations. She is a founder, principal and consultant to a number of local companies including her current role of Partner and V.P. Business Development of Voltaric Inc., a data analytics company. Karen is the immediate past-President and CEO of WEtech Alliance. As President and CEO of Walkerville Brewery, Karen led them to multiple awards including a 2006 World Cup Beer Winner. Other successful ventures include well-known establishments such as Plunkett’s Bistro, Caterings Café, and Chez Vine Wine Bar. Board leadership experience includes Windsor Utilities, St. Clair College, Essex Region Conservation Foundation, WEtech Alliance, Ontario Craft Brewers, Co-Chair of Windsor-Essex County United Way Campaign, Windsor Essex Capital Angel Network, in addition to many sub-committees and service boards. Karen has been awarded the 2000 International Athena Award (only the second Canadian) as well as being appointed Honourary Chair of Big Brothers Big Sisters of Windsor Essex, and the Alzheimer Society of Windsor-Essex County. Founder and Partner of Cooper’s Hawk Vineyards, Tom O’Brien was a Chartered Accountant and Managing Partner with PricewaterhouseCoopers of Windsor. Having established the first tax department in Windsor, he went on to become the Global Tax Group Leader for the Consumer and Industrial Products Group, the Leader of the Canadian Automotive Industry Group, and a member of the Canadian Tax Leadership Group. Tom was a member of the PricewaterhouseCoopers Policy Board, the effective Board of Directors. Currently on the Boards of WindsorEssex Economic Development Corporation and, Tourism Windsor Essex Pelee Island, Tom has also served in many community leadership roles as Chair, Treasurer, or Board member to several agencies, including St. Clair College, University of Windsor, Assumption University, United Way, Windsor/Essex County Hospitals Foundation, Essex Regional Conservation Authority, Southwest Ontario Tourism Corporation, and both the Essex Pelee Island Winegrowers Association, and the Winery and Grower Alliance of Ontario. Currently, Tom has also been nominated to election of Fellowship, PricewaterhouseCoopers LLP. 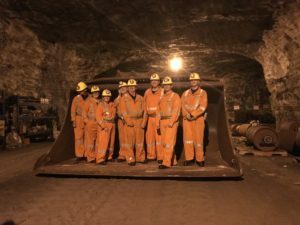 President and CEO Steve Salmons and Harbour Master Peter Berry (4th and 3rd from the right) on mine tour at Windsor Salt (K+S), 975 feet below the surface. Each year, the Windsor Mine ships more than 1.5 Million tonnes of rock salt to cities in Ontario, Ohio, Michigan and Illinois. 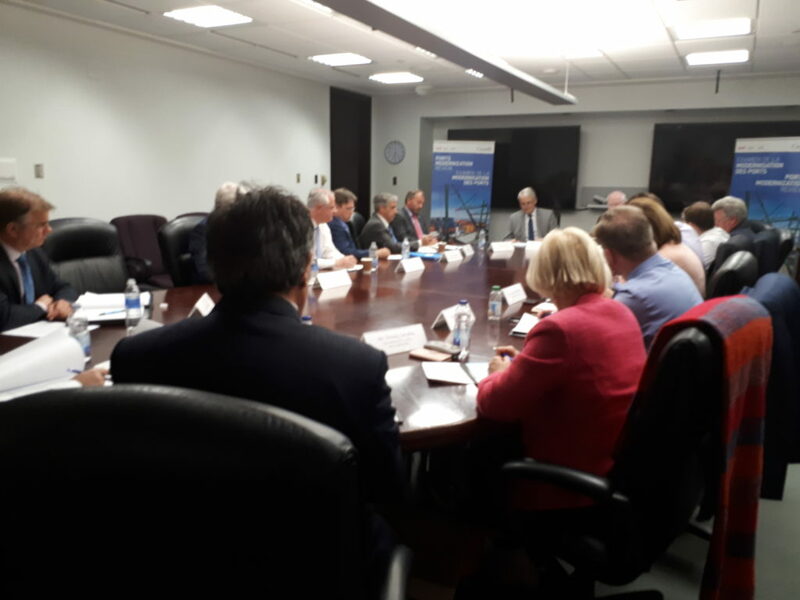 CEO Steve Salmons attends roundtable with Transport Minister Marc Garneau to discuss the Modernization of Canadian Ports. 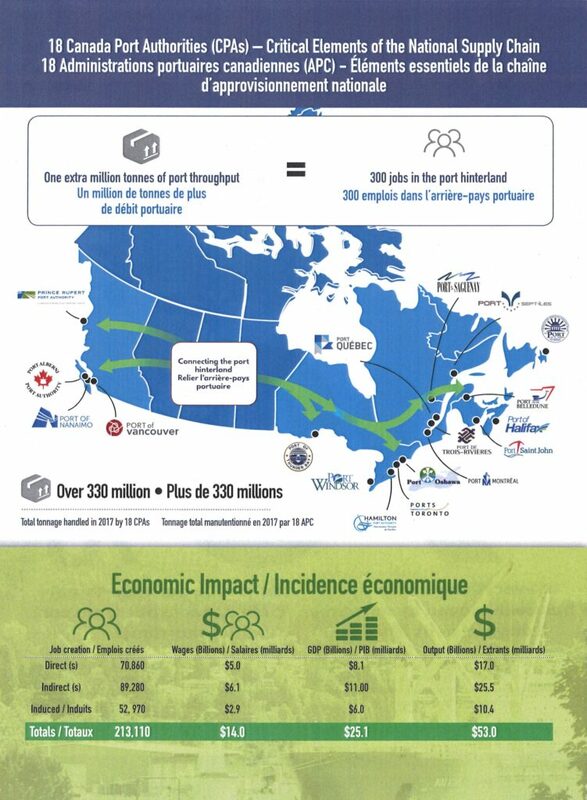 Each year, more than 213,000 jobs and $14 billion in wages are created by the movement of goods and people through Canadian ports. 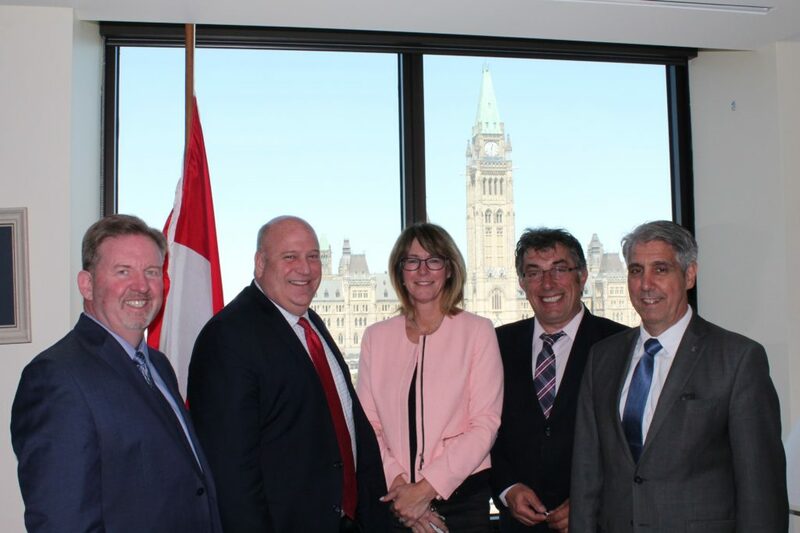 Steve Salmons participates in Parliament Hill Day in Ottawa. 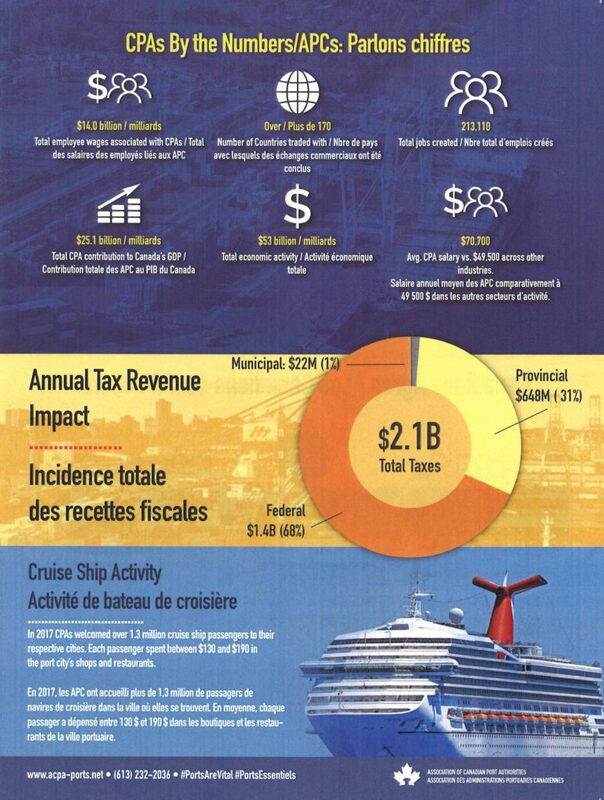 Ports in Canada handle 62% of all import and export tonnage within Canada. Ports are responsible for 213,000 direct and indirect jobs. The Windsor Port Authority will be hosting a “Grand Opening and Naming Ceremony” for the parkette at the foot of Mill Street commencing at 12 noon on Tuesday April 24, 2018. Click here to read full Press Release. The Ojibway Shores property located between Black Oak Natural Heritage Park and the Detroit River is recognized as extremely significant environmental land providing habitat to rare fauna and flora as well as numerous species-at-risk. Due to the significant damage done over the past year, the property is currently closed to the public in order to allow the area to environmentally regenerate. Notice is posted on the property indicating no entry. Please click here to access full document. The Windsor Port Authority Board is pleased to announce the appointment of Mr. Steven C. Salmons as the incoming President and CEO of the Port effective May 1, 2018. Mr. Salmons will assume responsibilities following the retirement of David Cree, CEO of the Port for the past 33 years. George Sandala, Board Chair, notes that Mr. Salmons’ demonstrated leaderships skills and accomplishments throughout his career ensures the continued success Port of Windsor has experienced under the leadership of David Cree. Mr. Salmons is a graduate of the University of Windsor having achieved a BA in Psychology, an Honours BComm in Labour Relations, and an MBA in Strategic Studies. He has over 25 years in senior executive and advisory leaderships roles. As former CEO of the Windsor Public Library, Mr. Salmons led the team to become Canada’s most award winning library, achieving not only national awards of excellence, but also a North American first for service innovation. He has served as General Manager, Community Services for the City of Windsor and Senior Policy Advisor in various Provincial Government Departments, notably the Government’s No.1 economic priority – the Windsor Border initiative. As Director of Community and Development Services for the Town of Lakeshore, besides a number of strategic accomplishments to ensure implementation of Council’s agenda, Mr. Salmons identified and negotiated property acquisitions that created the largest beachfront on the north shore of Essex County and was also instrumental in the development of the $62.0 míllion Atlas Tube Centre and Recreation Complex. 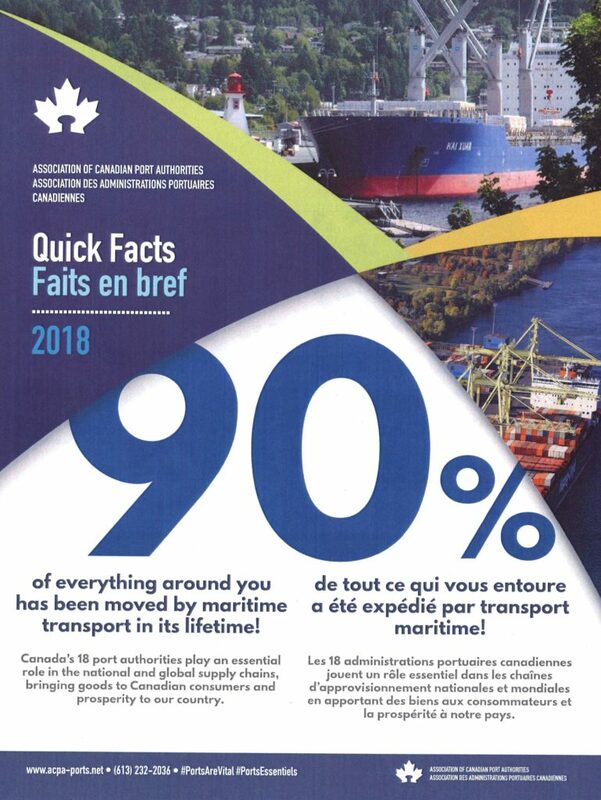 Recently the Honourable Marc Garneau, Minister of Transport, announced a review of Canada Port Authorities to optimize their role in the transportation system as strategic assets that support inclusive and sustainable growth and trade. “The Canadian Port Authority system needs to be re-examined to ensure Canada is always well positioned to innovate and compete for years to come.” ln view of Minister Garneau’s announcement, George Sandala has indicated Mr. Salmons’ extensive diverse experience and knowledge will certainly add value to his contribution as CEO of Windsor Port Authority to Transport Canada, identifying potential policy, legislative and regulatory changes to help Canada Port Authorities consolidate their position as key players in the Canadian economy. After unexpected declines in the 2016 season, the port rebounded nicely in 2017 with total cargo handled at all the port’s facilities increasing by almost 7%. The most significant gain was realized at the K+S Windsor Salt Company with shipments increasing by 20% to almost 2.2 million tonnes. Also having a very positive season was the ADM Agri-Industries which experienced an increase of just over 6% in total grain products moved through the facility. David Cree, President and CEO of the Windsor Port Authority, stated, “All in all 2017 was a very positive season. Our two major commodities have traditionally been salt and construction aggregates, and that continued this past year. As noted, salt shipments were up significantly while construction aggregates recorded a minor decline to just over 1.6 million tonnes”. Of the other cargoes handled within the port, petroleum products which are handled through the Sterling Fuels facility dropped by 4.2% to 256,924 tonnes and general cargo which is handled at Morterm Terminal and consists primarily of imported steel declined by just over 7%. Other important milestones during 2017 included near completion of the green space and fishing pier at the end of Mill Street and the beginning of public consultations for the development of the green space on Sandwich Street which is adjacent to the Port Authority offices. 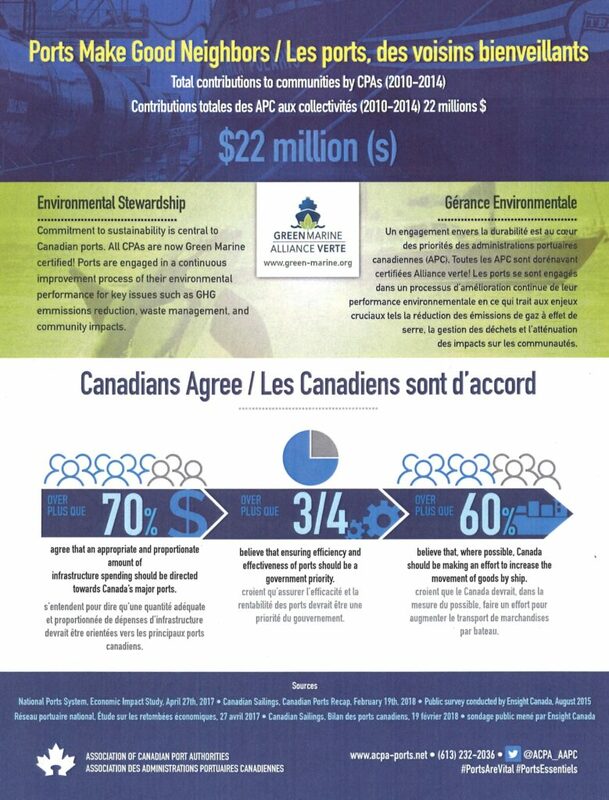 In conclusion, Mr. Cree stated “We were very pleased with the final results for 2017 and with the scheduled start of construction of the new Gordie Howe International Bridge slated for later this year, we are projecting moderate growth in 2018 and continued growth for four to five years thereafter”. …a sign of city’s thriving economy, says CEO. Please click here to see full article in CBC News.